Channel 7 is No. 1 on air and on social media! NEW YORK -- WABC-TV, the ABC-owned television station in New York, continues to be the most watched station in the nation's largest media market. Finishing 2015 with a 3.1 rating/8 share in DMA Households, Monday-Sunday Sign-On to Sign-Off, WABC-TV continues its run of dominance in the Tri-State area. With an average quarter-hour audience of 287,000 viewers all year long- 3,000 more than last year, Channel 7 attracts a larger audience than any other television station in the nation. The station also leads the market among local broadcast pages in Facebook Likes and Twitter followers. 2015 was another big year for WABC-TV and its signature "Eyewitness News" franchise, which continues to be the dominant broadcast news source for the New York market and added even more hours of live, local news to its regular schedule. The "Eyewitness News" team offered many hours of special coverage for major local stories such as September's visit to the area by Pope Francis, a building explosion in New York City's East Village, a jet skidding off a LaGuardia Airport runway, the New York Mets' run to the World Series, and the shooting deaths of two on-duty NYPD officers. Because New Yorkers remain focused on public safety, "Eyewitness News" reported from Paris and San Bernardino on terrorism strikes. Channel 7's consumer unit "7 On Your Side" helped recover $1.3M for local viewers, its third consecutive year over the million-dollar mark. Once again, WABC-TV brought viewers 8 hours of live coverage of the city's biggest local sporting event: the 2015 TCS New York City Marathon. More than one million people watched the race on Channel 7, and ESPN2 provided live coverage to the rest of the country. The marathon also had 110,000 live video stream starts that were accessed in 182 different countries, making the race a truly global success. "Eyewitness News" also added a weekend 5pm newscast to its lineup in September, extending the station's long record of successfully introducing local news into new time periods. These newscasts have considerably improved their time period deliveries while expanding the station's reach in the market. At 9am, perennial favorite "LIVE with Kelly and Michael", featuring Kelly Ripa and Michael Strahan, is #1 for the year among DMA Households in New York, attracting more than twice as many homes as any competitor. The program also dominates among Women 18-49, Women 25-54 and Adults 25-54 and demonstrated significant year-to-year growth in each of those areas. The show's annual post-Oscars telecast, live from the Dolby Theater in Los Angeles, was again a huge ratings success. This longtime staple's annual Halloween show in October delivered more viewers nationally than do many prime-time shows. "LIVE with Kelly and Michael" is the 2nd most-watched daytime talk show in the country despite airing in an earlier time period than most of its competitors. The program is produced by WABC-TV and syndicated nationally. Channel 7's weekday success begins with "Eyewitness News This Morning" with Lori Stokes, Ken Rosato, Bill Evans, and Heather O'Rourke. From 4:30am-5:00am, Channel 7 attracts more DMA Households than anyone else. In the 5:00am-6:00am hour, "Eyewitness News" holds a 90% lead among DMA Households and a 50% advantage among Adults 25-54, an area in which it has increased its viewership from last year. And in the 6:00am-7:00am hour, "Eyewitness News" is also #1 in the market with a 68% advantage among DMA Households and a 60% edge among Adults 25-54. "Eyewitness News at Noon" successfully switched lead anchors earlier this year, with David Novarro and Shirleen Allicot joining Bill Evans, and did not miss a beat in the ratings. The show ranked #1 among mid-day newscasts with a 20% lead among DMA Households while attracting nearly as many Adults 25-54 and Women 25-54 as its competitors combined. "Eyewitness News First at 4" with Liz Cho, David Novarro and Lee Goldberg, is the market's only 4:00pm newscast, and it tops all of its 5:00pm and 6:00pm local news competitors among Adults 25-54 despite airing at an earlier hour. WABC-TV's "Eyewitness News at 5" with Diana Williams, Sade Baderinwa and Lee Goldberg wins its time period among DMA Households and holds a +44% advantage among Adults 25-54. The weekday edition of "Eyewitness News at 6" with Bill Ritter, Liz Cho, Lee Goldberg and Rob Powers, delivers a DMA Household rating that is 46% higher than its closest competitor and attracts more than twice as many Adults 25-54 as any competitor. The weeknight edition of "Eyewitness News at 11," featuring Bill Ritter, Sade Baderinwa, Lee Goldberg and Rob Powers completes the total victory for "Eyewitness News" in 2015. WABC-TV wins the late news race among DMA Households for the year and is #1 among Adults 25-54 with a 46% advantage over its nearest competitor. "Eyewitness News" is equally strong on weekends throughout the calendar year. "Eyewitness News This Morning" with Michelle Charlesworth, Rob Nelson, and Amy Freeze, collectively ranked #1 in DMA Households and Adults 25-54 in 2015 while offering more local weekend morning news than any other station in the market. On weekend nights, "Eyewitness News at 11," a one-hour newscast featuring Joe Torres, Sandra Bookman, Jeff Smith and Laura Behnke, is #1 in DMA Households and Adults 25-54. ABC News also continues to perform well on Channel 7. ABC's "Good Morning America" continues to be the top choice in the time period for Tri-State area viewers. The program again ranked #1 for the year among DMA Households, Adults 25-54 and Women 25-54. In the evening, ABC's "World News Tonight with David Muir" holds a stellar 68% lead over its closest competitor in DMA Households and has a 70% edge among Adults 25-54. ABC's other weekday programs also continue to thrive on Channel 7. On weekday mornings, ABC's longtime staple "The View" continues to win its time period among Women 18-49 and Women 25-54. At 1:00pm, "The Chew" continues to win its period among DMA Households, Women 18-49 and Women 25-54. ABC's "General Hospital" continues to lead its time period competition in DMA Households and key demographics. In Late Fringe, "Jimmy Kimmel Live" continues to perform well. It ties for #1 in DMA Households and continues to generate buzz with successful viral videos. ABC's veteran "Nightline" remains a strong entry at 12:30am, winning the time period in DMA Households. WABC-TV's syndicated programs "Jeopardy" and "Wheel of Fortune" continue to be #1 in Prime Access in DMA Households and most key demographics. From 7:00pm-8:00pm, "Jeopardy" and "Wheel of Fortune" attract more than twice the number of viewers of any competitor among DMA Households and Adults 25-54. In Primetime, ABC successfully introduced "Quantico" and "The Muppets" to a line-up already packed with successful shows that include "How to Get Away with Murder," "Black-ish," "Scandal," "Modern Family," "The Middle," "The Goldbergs," "Grey's Anatomy," "Dancing with the Stars" and "Shark Tank." By November, WABC-TV's Prime shows held 6 of the top 10 spots among regular programs among Adults 25-54. WABC-TV also continued to maintain its strong ties to the local community with its airing of October's annual Columbus Day Parade, last spring's New York City Half-Marathon, and campaigns for Operation 7 Save-A-Life for fire safety, Above & Beyond for hometown heroes, Breast Cancer Awareness, Black History Month, Hispanic Heritage Month and other campaigns throughout the year. Channel 7 also had success with its local specials, including two editions of Broadway Backstage, coverage of the Bethpage Air Show, the annual Holiday Special, Protect Our Children, and Connected 4 Life for organ donation. WABC-TV's website, abc7ny, has the highest user engagement of any local broadcast station's website. Its average of 35 million minutes of usage per month in 2015 was 72% higher than the next closest station. 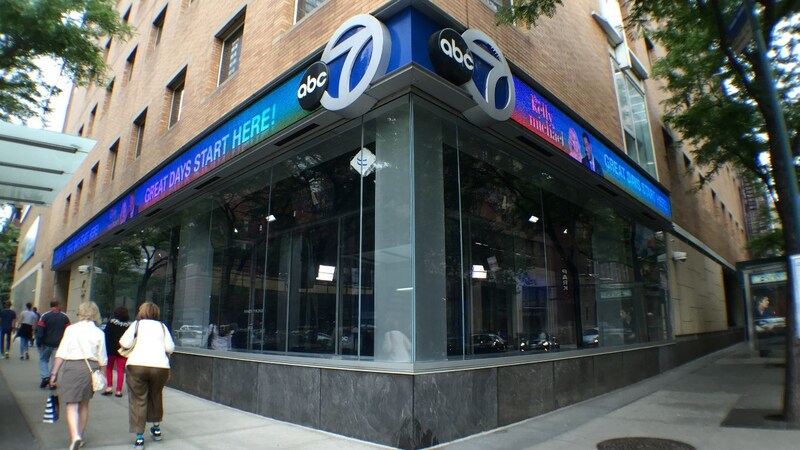 Channel 7's mobile apps - Eyewitness News, Weather, and Alarm - combine with abc7ny to deliver more than 30 million page views every month. WABC-TV's main Facebook page has 1.3M Likes, more than any other station in the market. On Twitter, Channel 7's main feed has 270,000 followers, also the market leader. Eyewitness News Facebook talent pages, Twitter and Instagram feeds continue to have consistent engagement with thousands of viewers on a daily basis in the country's largest market.